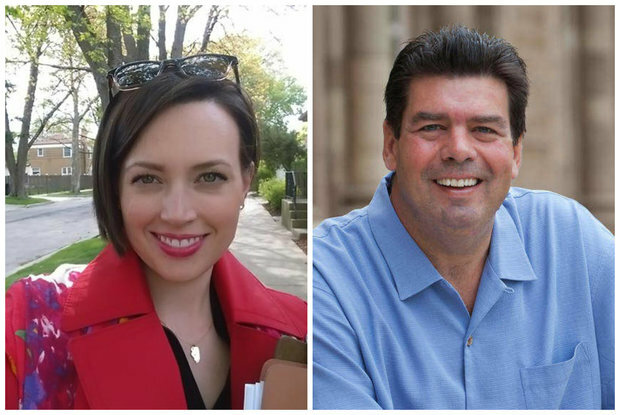 EDISON PARK — Election Day might be nearly six months away, but the race for the 20th District seat in the Illinois House is in full swing, with mailboxes filling up with glossy fliers and phones ringing with robocalls. State Rep. Michael McAuliffe (R-O'Hare) — who is the only Chicago Republican in the Illinois General Assembly — is seeking an 11th term representing the district that includes parts of the 41st Ward along with several suburbs northwest of the city, including Park Ridge and Des Plaines. But to hang on to the seat that he has held since 1996, McAuliffe will have to defeat anti-O’Hare noise activist Merry Marwig, who will have the support of unions aligned with the Illinois State Democratic Party, including those affiliated with the Service Employees International Union. A poll paid for by SEIU Healthcare released Tuesday found that 45 percent of district residents planned to vote to re-elect McAuliffe, while 40 percent said it was time to elect someone new and another 15 percent said they were not sure. McAuliffe, who was elected to another term as the 41st Ward Republican committeeman last month, was elected to replace his father, Roger, who held the 20th District seat from 1973-96, when he died in a boating accident in Wisconsin. "I've never seen the election start so early, that's for sure," McAuliffe said. SEIU State Council Executive Director Gerald Morrison said his union and others believe McAuliffe can be defeated. "This is one of the few districts that could change hands" from the Republicans to the Democrats, Morrison said. "It will attract a lot of resources, that's for sure." In an interview with DNAinfo Chicago, McAuliffe said he wasn't too worried by the poll or the decision of some of the state's largest unions to support his opponent's campaign. "The best poll is what I hear from the community, and from what I'm hearing I think it will be fine," McAuliffe said. "I'm just focused on the work we have to do in Springfield." Marwig, who declined a request from DNAinfo Chicago to be interviewed, said in a statement neither she nor her campaign were involved in the union's poll or advertising efforts. Marwig, one of the leaders of the group that formed to protest the racket made by planes using new east-west runways at O'Hare Airport, said she decided to run because of her "frustration with state government and the lack of leadership" from McAuliffe. Marwig promised to "bring a fresh perspective to Springfield" if elected. Despite his optimism, McAuliffe acknowledged the stalemate that has left Illinois without a budget for 10 months could make winning re-election difficult for any incumbent. "It is a tough year, that's for sure," McAuliffe said. Gov. Bruce Rauner has refused to sign a budget until Democratic lawmakers — led by Speaker of the House Michael Madigan — agree to adopt his pro-business agenda. Democrats refused, and the impasse has yet to be resolved. 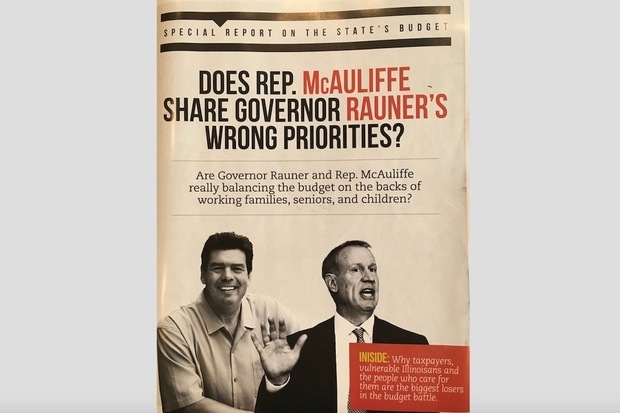 In the fliers piling up in residents' mailboxes, SEIU Healthcare of Illinois and Indiana pictures McAuliffe next to Rauner and asks whether they share the same "priorities." The union has repeatedly charged Rauner with trying to balance the state budget by cutting services for poor, elderly and sick residents. The mailer sent by SEIU Healthcare Illinois & Indiana seeks to tie Michael McAuliffe (l.) to Gov. Bruce Rauner. The union, which organized protests of the governor, is in contract negotiations with him over wages for home health care workers. Just 34 percent of Illinois residents approve of the job Rauner is doing, according to a poll released earlier this week by Morning Consult. That is down 8 percentage points from a similar survey taken last year. The union's poll found that 42 percent of residents in the 20th District would be less likely to vote for McAuliffe if they knew he was supported by Rauner. Rauner's deep unpopularity will pose a significant problem for McAuliffe's re-election bid, Morrison said. "He will be made to wear the Rauner agenda," Morrison said. "And there are a lot of moderate Republicans in this district who are very turned off by the governor." If Marwig does mount a serious bid for office, she will need the help of deep-pocketed unions to overcome McAuliffe's flush campaign bank account. Both candidates were unopposed in the March primary elections. At the end of March, Marwig — who is going door to door to meet voters — had $4,600 on hand, according to reports filed with the Illinois State Board of Elections. Among her largest donations were $500 from state Rep. Robert Martwick (D-Jefferson Park) and $500 each from the International Brotherhood of Electrical Workers and the International Union of Operating Engineers. Marwig also received an in-kind donation worth $750 from a political action committee controlled by Madigan. By contrast, McAuliffe had $39,600 in his campaign account at the end of March, according to reports filed with state elections officials. Since April 1, McAuliffe has received at least another $11,400, including $5,400 from Citadel, a hedge fund run by Ken Griffith, one of Mayor Rahm Emanuel's largest campaign donors and Illinois' richest man. Morrison declined to say how much money SEIU and its affiliated unions were prepared to spend to defeat McAuliffe and end another Chicago political dynasty. "No one is bluffing here," Morrison said. "This is a top-tier target."